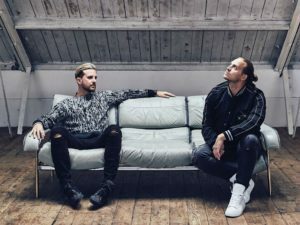 Drum & Bass duo Sigma have fast become one of the most success DnB crossover acts in the country and they’re bringing their eclectic high energy show to Ministry of Sound later this month. Cam and Joe have had a rollercoaster of a journey since first breaking through with “Rudeboy” in 2013. Since then they’ve travelled the globe, headlined festivals, had Ibiza residencies and even had the odd Ministry of Sound headline slot! We got a chance to sit down with Sigma ahead of their 27th January headline slot to talk 2018 and beyond. Have a read of the interview below, and if you want to come down, tickets are on sale here. MoS: So first of all, were are you right now and what was the last gig that you played? Sigma: At the moment, we are in Manchester as we have a place up here, and the last gig we did was in Dubai for NYE. We had an amazing time and was great to see the new years in doing the midnight slot with the fireworks. It was an incredible experience. That must have been amazing, so how was 2017 for SIGMA, and what were the highlights? I think The Royal Albert Hall was the main highlight for us last year, we had so many great experiences and performances but this was special. The Royal Albert hall was your last major London headline show; can you describe how this felt? What an occasion! Definitely, it was a complete step into the unknown for us, because we were doing something at a venue that is traditionally not a dance venue. However it was amazing to put ourselves out there to try a new challenge and it ended up being such a sick event and we sold it out. You were also the first Drum & Bass act to sell-out the Royal Albert Hall, how did that feel? Well there you go, we put so much work into it and I don’t think people understand how much work went into this show. The logistics were so hard but we managed to do it. We have had people say to us ‘I hope you do it again soon’, but this would have to be something we plan well in advance. We would love to and it was a great experience but this would be something down the line potentially but what a night! Other London shows in 2017 included the likes of SW4, how do you find playing in London and what makes it special? People always ask when we are abroad ‘what’s your favourite city to play’, and we never forget London. Not only because we are from England, but also because it’s the main place to play. It’s the heartbeat of Drum & Bass, and for us it’s the heartbeat of dance music. Coming through the ranks and playing at places such as Fabric and Cable, you can see the dance culture in the UK and how strong it is. Every time we play in London we love it, and all of our friends can come to it, so it’s always a special occasion. South West Four was a great event in the capital last year, we did so many festivals and shows last summer but it was definitely a highlight. Onto the 27th January, your long awaited return to Ministry of Sound, first of all how does it feel to return and to begin 2018 in this way alongside a great lineup? It’s amazing, the last time was just after we released “Changing” and we both did the show and was one of our first major headline shows in London. The lineup is brilliant as it showcases and reflects what we want to play in our performances. We aren’t just Drum & Bass, and the lineup reflects that and it’s set to be an incredible night with huge artists on the bill such as Ookay and DJ Guv. Your last Ministry show was in 2014 how was this event and what does Ministry of Sound mean to you? Going back now after so many years and with all our new material and experience behind us, I think it’s going to be an exciting evening. It’s one of the best clubs in the world in one of our favourite cities so it’s long overdue. The ministry sound system is said to be the best in London, you must be excited to return to perform on this? Oh definitely, it’s always great to hear your tunes full volume on a sound system like that. It will be amazing; we are going to test out a lot of new stuff and taking it back so we cannot wait for the set. The show is Togethers first stand-alone show of 2018, are you looking forward to being a part of Togethers first event of the year? It’s amazing to headline the first London show of the year. We have had a long running history with Together over in Ibiza, and every year we go over to Amnesia and play for Together and it’s always incredible. This show solidifies our respect and partnership with Together, and we love the guys who put on the events. It’s great to be a part of the first show of 2018 and we cannot wait to be a part of the huge night for Together. Onto your performance, what can fans expect from the set, old hits and new bangers from the new album? We have been working solidly in the studio now for a while, and we have got a hell of a lot of new music. We will be testing some new music and by the time the gig comes around there may even be more music to test and play out which we can’t wait for. I think with Ministry it’s somewhere that allows you to open up and play whatever you want and we definitely are going to do that. We will also bring it back a bit though, with the older stuff we have done and the hits, with some bits people have never heard so we are definitely going to mix it up a bit. It will be great to test the new material in a club setting such as Ministry; you must be excited for this. Yeah 100%, on that system we cannot wait for the reaction of the new material and especially when we switch it up and play our classics as well as all the hits and other material that will surprise the crowd. Brilliant, now your latest single ‘Forever’ features a new sound for SIGMA, is this sound a reflection of the direction going forward? Yeah we love this tune, it’s a funny one as it’s not a dance record or hip-hop, and it fits in-between the two genres. We did this record in LA with Sebastian Cole and we instantly loved it. It stuck with us and when we got Quavo and Tinie Tempah on it we had to get it out. It’s been unreal playing it out and the reaction to this new sound for us has been phenomenal. It was something we tried to be different, and we tried to be a lot more experimental with genres. It’s not necessarily the direction that we are looking to go, but we enjoy putting out other genres and trying new things. What is in the pipeline for SIGMA in 2018? Album? Singles? Huge shows? And is 2018 set to be the biggest yet? Well this show is definitely the perfect way to kickoff 2018, and 2018 is set to be huge. The festival shows are starting to get announced and organised and also Ibiza. We are slowly stepping back into it in terms of shows and this Ministry show is our first big one of the year and the one that will set the tone for year. We have so much music as well in the pipeline to release in 2018, but we need to decide the best plan of attack. We have a lot of tunes, and trying out some more dnb bits definitely this year. In terms of the new music, anything going back to the original roots of SIGMA like “Rudeboy”? Funny you say that, we have had some ideas and are in the process of sorting some jungle bits. We want to plan and put everything out, and returning to Jungle this year is a possibility. We will definitely be playing some out in our set and we cannot wait for that at Ministry. Lastly, what can you promise for fans ahead of this show? Well anyone who has seen us play before, it’s going to be similar but with an extra edge of party vibes with a club setting and that being the iconic Ministry of Sound. For anyone who hasn’t seen us, bring your wallet, get your drinks, get your dancing shoes on and have a good time because it’s probably going to be the best party of the year. We want everyone to have a good time and party with us and we can promise that it’s going to be an ultimate party, and the perfect way to kick off the year.